Designers, manufacturers and outfitters of custom airplane interiors for private and corporate jets have found Stone Ply to be a useful way to introduce the luxury and high-end appeal of stone to their projects. StonePly is real natural stone, granite, marble, limestone or onyx on an aluminum honeycomb backing. StonePly offers a lightweight, strong and attractive real stone finish for airplane galleys, lavatories, flooring and tables. In addition to the beauty and uniqueness of natural stone panels for aircraft interiors, StonePly also offers custom marble and granite medallions, logos and emblems for use on floors, tables and partitions. The U.S. Department of Transportation Federal Aviation Administration (FAA) requires certain materials be fire tested. This page is a brief summary of StonePly’s test results and flame resistance abilities. For additional information on testing of aircraft materials, refer to the “Aircraft Materials Fire Test Handbook” for a description of all FAA-required fire test methods for aircraft materials. StonePly offers designers of aircraft interiors a non-flammable panel made up of a thin stone face bonded to a non-flammable aluminum honeycomb backing panel with a thin layer of high strength epoxy. This is a test for airplane interior finishes. This FAA test method is intended for use in determining the resistance of materials to flame when tested according to the 60-second and 12-second Vertical Bunsen Burner Tests specified in Federal Aviation Regulation (FAR) 25.853 and FAR 25.855. Samples were 3/4″ StonePly (1/4″ stone face and 1/2″ aluminum honeycomb), 3″ by 12″ samples. 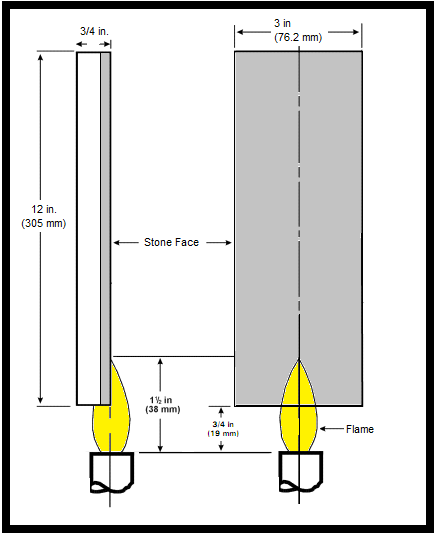 The StonePly stone panels were exposed to the flame from a 3/8-inch Bunsen burner with a 1550°F minimum flame temperature for 60 seconds. No sample ignition, flaming, dripping or spread of flame. The StonePly stone/aluminum honeycomb panel did not ignite, flame, drip or spread flame. This test method is intended for use in determining the resistance of materials to flame when tested according to the 15-second horizontal Bunsen burner tests specified in FAR 25.853. In this test, materials for airplane interiors are subjected to the flame of a Bunsen burner. Both StonePly granite on aluminum honeycomb and StonePly marble on aluminum honeycomb panels were tested. This document is produced in the interest of information exchange. While the contents are believed to be accurate and complete, StonePly assumes no liability for the contents, their completeness or use thereof. For more information, visit StonePly.com, email info@stoneply.com or call 903-454 4630. StonePly is the leading stone on aluminum honeycomb panel manufacturer. To meet its commitment to provide “any stone form anywhere in the world” StonePly maintains a global network of procurement in Europe, South America, Asia, Africa and the stone quarrying centers of the world. Offices, manufacturing and warehousing facilities are in Greenville, TX. Family owned and operated for over 25 years, StonePly is the oldest stone on aluminum honeycomb panel manufacturer and supplier under the same ownership. Clients and commissions include NASA, The US Nuclear Regulatory Agency, US National Park Service, Rolex, Hyatt, Disney, Atlantis Resort, Four Seasons and others.